A couple of weeks ago, Tyler and Chris summed up the eight things they'd like to see in Sea of Thieves at launch. Like them, I enjoyed the basics of Rare's pirate game and wondered if it would have enough meat on its bones to keep people playing long after launch—as fun as it may or may not be to lock someone in the brig. During a trip to the studio last week, I learned more about the kraken, trading companies and the endgame at launch, which you can read about here. Below, I asked design director Mike Chapman if the eight specific things we want from Sea of Thieves will make it into the game when it releases on 20 March. And the answer is, about half of them will. Here's what he had to say about each one, with an additional contribution from Rare's Ted Timmins on a more PC-specific subject. "In the game for launch," Chapman says. We ended up collecting a lot of chests in the closed beta, but expect more variety in the finished game. "There are treasure artefacts in the game for launch that aren't in a chest. That's in the game for launch." We included this with one or two-person crews in mind, who want to run quests without encountering four-player ships parked at outposts ready to fire the cannons. 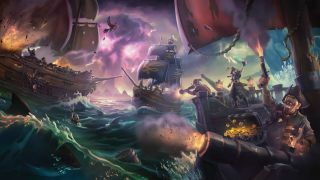 Sharing the seas with other players is the game's core idea, however, as fraught as it may get. "Never," says Chapman. One of Sea of Thieves' trading companies, The Merchant Alliance, will task you with collecting pigs, chickens and snakes among other goods, which each need to be maintained in different ways, and will drown if your ship sinks. That's an extra activity on top of sailing and manning the cannons. "I think Sea of Thieves has always been about enriching the journey," Chapman says. "It's about the journey and not so much the destination. But more ways to enrich the journey, no doubt. There's more of that for launch with the animals and all the fun encounters that can happen when you're on the ship, but even beyond launch we'll add more in that area, undoubtedly." "100%. Will happen," says design director Mike Chapman. "Linking them to progression in some way...there's an example of that for launch, I'll say, which is really powerful. But beyond launch we'll go even deeper on it. What's magic about the mechanic is, you could have a shanty I don't have. You play the lead, and I can harmonise with you—that's the way that mechanic works. And at the moment for launch, apart from one example, everyone's got the same shanties. But having the idea that I can play a tune you don't know but you can still join in, yeah." "Our focus was always that the ship's fundamental design is equal to the number of players, so the number of the jobs and how players organise is kind of our core gameplay if you think of it that way. There's a lot of people out there asking, 'I want the twenty-person ship, I want the thirty-person ship, I want the ten-person ship', and our approach was always to think of real life. If you get a group of ten people together, it's very hard to co-ordinate ten people. Even if you go to the pub together, you've got people splitting into separate groups. It feels like you're out in two groups rather than one cohesive whole. So that will always factor into our decision making. Will we do more ships in the future? I think so, I think there's a possibility. We'd look at it for sure." I ask Chapman if more styles of ship will be added, not just ships determined by the number of people aboard. "I think so, I think we'll look at that kind of thing. There's some plans about how we extend the gameplay post-launch that ties quite well into ships, but no definite plans at the moment." "In for launch. You've got the kraken, arguably is one of those, and you've got the skeleton fort which is definitely one of those." The kraken is a large-scale fight that multiple ships can participate in, and the skeleton forts are described as 'horde modes' where players have to fight loads of skeletons, often in tandem with other crews for an uneasy alliance. "The fort cloud you can pretty much see from across the entire map for that reason alone." "We have talked about it," says PC design lead Ted Timmins. "The thing that gives me great confidence about Sea of Thieves is we're 150+ updates into a game that isn't even out yet, and when we talk to our community, we do try to say, 'we might not have everything you want at launch, but we're pretty good at listening and acting and very very good at updates'. So when it comes to the mod side, obviously you can't talk about PC gaming and not talk about mods… For Sea of Thieves, we first need to get out the door. What is Sea of Thieves at launch? And how does that grow over time? "Regarding servers and services, we actually had a really long conversation this morning, just about, how do we want to support players who like private, public, custom, closed, whatever it might be, over time? There's a much wider discussion to be had around that kind of stuff, because the way that our services work, they're all quite expensive, dedicated servers, because when we had initial discussions, [we decided] players prefer dedicated servers, let's totally focus on that. But then if you were to have a private server you could effectively be the only person in that server at a huge cost. "So, yes, we're talking about it, and is there more to talk about? Yes. For now it's about matchmaking with your crew and friends. That's our initial goal. And beyond that, we'll look to alliances and potentially guilds or factions or whatever we term it in Sea of Thieves. That's how we're looking to the future. You can play the game solo, as a duo, and as four—what's the natural growth from that? It's probably an alliance. Matching sails, matching flags. And you have a fleet, an armada." "Ooh! We'll definitely do something with parrots and monkeys," says Chapman. But maybe not at launch? "Not at launch, but there are some interesting plans around how we use our animals. Want to fire a parrot out of a cannon?" Chapman's joking about that last bit. I ask if you can fire snakes out of a cannon onto enemy ships, since snakes can attack players, but sadly it's not to be. Well, it's not sad for the snakes, I guess. Sea of Thieves is out on 20 March.